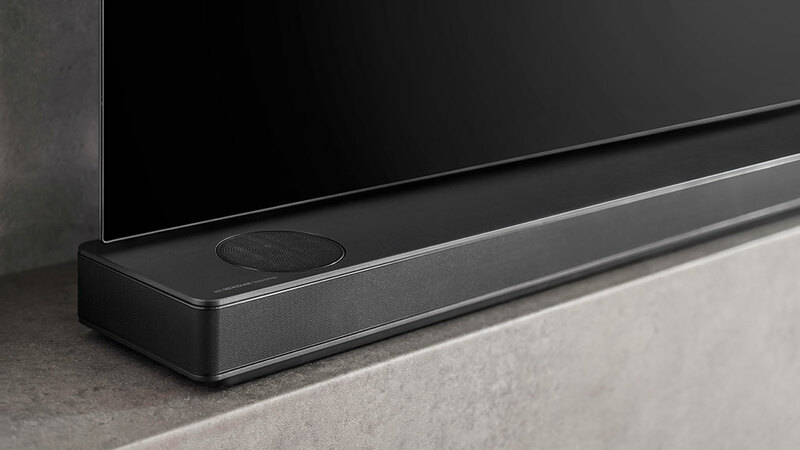 A soundbar that aspires to do it all, the LG SK10Y boasts Dolby Atmos support, High-Res Audio certification, Google Assistant functionality and Chromecast compatibility. Thanks to a new partnership with British hi-fi specialist Meridian Audio, it also carries some impressive sonic credentials. Having driven the luxury TV agenda with OLED, LG now wants to take similar leadership with audio, and Meridian seems the perfect partner to help. The high-end audio outfit has been involved in component choice as well as physical construction, but has this really made a difference? The SK10Y heads a trio of LG Dolby Atmos soundbars, along with the smaller SK9Y, and entry-level 2.1 channel SK8Y. Having spent some time with the SK10Y, we can say that it practically ticks every box one might have when looking for the ideal soundbar. However, with a suggested price of $1099 (£1,199 / AU$1,699), the LG SK10Y isn't the cheapest Dolby Atmos soundbar around. That said, those who own a recent LG television may want to consider the SK10Y thanks to the South Korean company's seamless integration of the two devices. The SK10Y is a big beast. 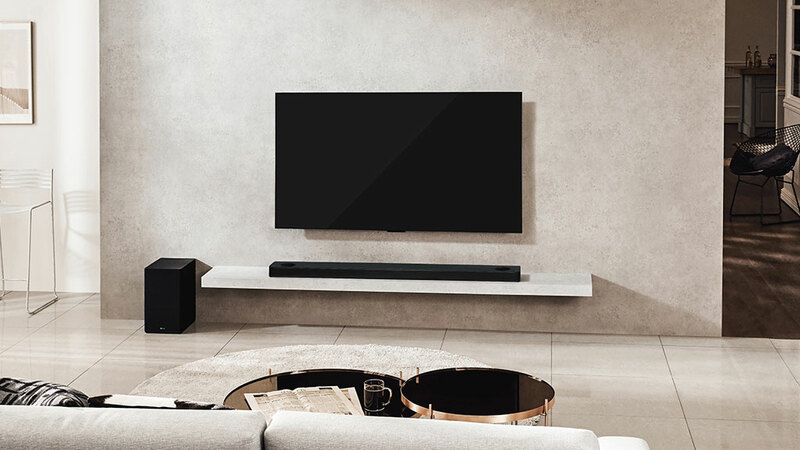 A full 65 inches wide (144cm), it’s the largest soundbar LG has ever produced, and requires either a really wide AV table or wall area for mounting. The latter is achieved via an L-shaped bracket, and this causes the big bar to jut out from the wall significantly – not a great look. The soundbar has integrated Dolby upfiring speakers, so it can’t be positioned in a cabinet, either. 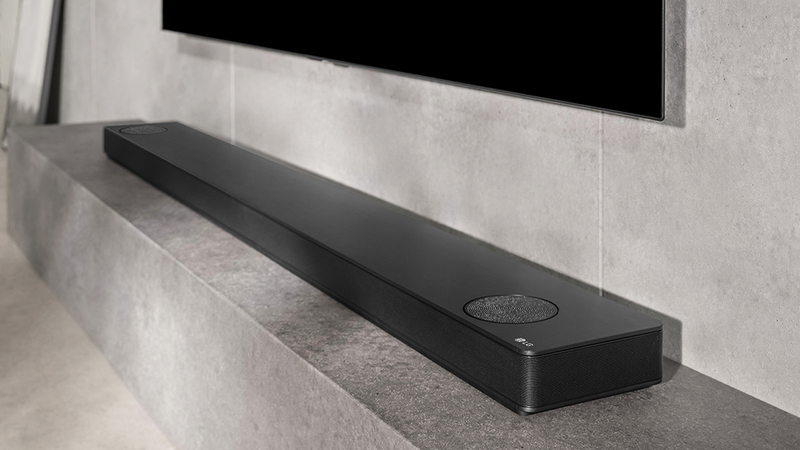 Potential buyers may also want to consider how LG's high-end soundbar will look underneath their telly. Thanks to its extreme width, LG recommends the SK10Y be used with TVs that are 65 inches and above in size, making it a less-than-ideal choice for those with smaller sets. The SK10Y comes with a wireless, 200W, front-firing subwoofer, more than capable of handling deep bass. This just needs to be parked nearby. In terms of usability, the SK10Y excels. We love that it has Chromecast functionality built in, and that it can be integrated into a Google-based multi-room audio system, which you can then control by voice via Google Assistant. Bluetooth streaming is standard, and connections include 4K HDMI passthrough (2x inputs and 1x output) and an optical audio input. When it comes to controlling the SK10Y, its remote control works well enough, with buttons to adjust volume, mute, change function and to play, pause and skip tracks during music playback, though we found that its streamlined design made it somewhat frustrating to use while adjusting audio settings. Fired up, the LG SK10Y certainly creates an impressive wall of sound. It’s designated as a 5.1.2 Atmos solution, which means that in addition to twin top-mounted speakers there’s a triple array on the front fascia (left, center, right), plus side-firing channels at either edge. These side drivers aren't designed to bounce sound off a wall; instead they use Acoustic Phase Matching to alter the timing of the audio, which creates an impression of surround sound. We tested the SK10Y with a number of 4K Ultra HD Blu-rays with Dolby Atmos tracks and came away very impressed with the three-dimensional audio that the soundbar was able to produce. First off, we tested Star Wars: The Last Jedi — a film (and series) known for boasting mind-blowing sound effects and music. Kicking off with the film's opening space battle, we experienced soaring dynamics as X-wing starfighters flew over our heads and laser blasts zipped right past us — or at least that's what it felt like. Next up, we tried out Justice League's punchy Atmos track and came away just as impressed by the immersive soundscape the SK10Y soundbar was able to achieve, particularly during underwater sequences featuring Aquaman. While we didn't necessarily feel like we were submerged in water, the soundbar did help sell the scene. The SK10Y isn’t just about movies. It’s High-Res Audio-ready, and 24-bit 192kHz-capable. It supports the usual selection of lossless codecs, but not MQA. Aluminum tweeters are able to reach up to a High-Res Audio badge-certifying 40Hz. LG also says these cones provide a higher sound pressure level over silk dome tweeters. The SK10Y had no problem pressure-loading our listening room. The unit's volume is prodigious. With a total power output rating of 550W, you’ll probably not want to run it on full whack. While all Dolby Atmos soundbars feature a height component, they tend not to create a fully immersive listening experience, at least when compared to a Dolby Atmos AV receiver using multiple physical speakers. The SK10Y tries hard to combat this. For one, it has variable overhead volume, which enables users to compensate for different ceiling heights. The company is also offering a separate pair of wireless rear speakers, the SPK8s. This package comprises a pair of diminutive, wireless forward-facing squawkers and a standalone 140W two-channel amplifier. When paired with theses rears, the SK10Y offers full 5.1 surround sound, plus height; effectively 7.1.2, with a total power output of 690W. It was in this configuration that we listened to the system. The SK10Y has been built around the standard Dolby DAP chipset, and includes features common to that, namely a dialogue enhancer, volume leveler and volume modeler. The latter is used to maintain levels of bass, even when volume levels are decreased. It prevents the audio stage wimping out when sensible listening levels are applied. Unfortunately, it also means the SK10Y can’t support DTS:X, the rival immersive audio format. However, the soundbar will decode DTS Master Audio, and this and other non-Atmos sound sources can be upscaled for all-channel listening. We tested this DTS upscaling effect with 4K Ultra HD Blu-ray of Interstellar, which lacks Dolby Atmos but carries a strong DTS-HD track that's both bombastic and subtle in its dynamics. Truthfully, the difference between Interstellar's DTS HD track and Star Wars' Dolby Atmos track was fairly minor to our ears, with both offering a terrific surround sound experience. Regardless of your chosen film's audio source, it's likely to sound fantastic on the SK10Y. LG's inaugural partnership with Meridian has resulted in a Dolby Atmos soundbar with surprising clarity and refinement. Capable of creating a wall of sound while also isolating more subtle sonic nuances, LG's SK10Y is a very impressive Dolby Atmos-ready soundbar. Whether you're listening to music over Bluetooth or shaking the room with a loud Hollywood blockbuster, the LG SK10Y will offer an excellent listening experience thanks to its expert tuning and powerful speaker setup. 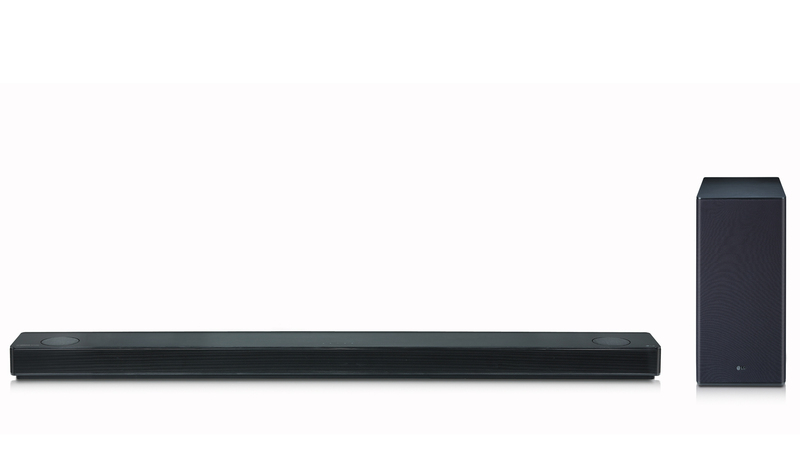 Admittedly, the SK10Y is a little pricey compared to some other soundbars on the market, and its overly elongated design may not suit all home theater setups. That said, the SK10Y is able to provide a wonderful three-dimensional soundscape capable of bringing the cinematic listening experience right to your living room. Editor's note: Stephen Lambrechts also contributed to this review.